Maruti Suzuki Swift Special Edition has been launched in India on the occasion of the ongoing festive season. It is based on the entry-level LXi and LDi trims, starting at a price of Rs 4.99 Lakhs. Maruti Suzuki Swift Special Edition has been launched. It comes at an introductory starting price of Rs 4.99 Lakhs and comes in both petrol and diesel variants. The Limited edition is based on the base LXi and LDi trims. A lot of auto brands are launching special editions, facelifts and more of their models. It is based on the base variant but gets many more features. The Special Edition gets additional features such as black wheel caps, body-coloured door handles, and body-coloured ORVMs on the exterior. Inside the cabin, it gets a Bluetooth music system with dual front speakers, power windows for driver and front passenger, central locking with remote and rear parking sensors. Leaving these features, it does not get any mechanical, cosmetic or feature upgrade. Now, the LXi and LDi variants get more fitments. Mechanically, the Maruti Suzuki Swift Special Edition continues with the same engines. It gets the 1.2 Litre K12M petrol engine and the 1.3 Litre DDiS diesel engine. The petrol engine produces around 82 BHP of power and 113 Nm of torque. The diesel engine makes 74 BHP of max. power and 190 Nm of peak torque. On both the engines, 5-speed manual transmission along with an optional Auto Gear Shift (AGS) transmission. The mileage claimed on the petrol variant is around 22 kmpl and that on diesel variant is around 28 kmpl. The base-variant also comes with Power & Tilt Steering and LED tail lamps. For safety front, it gets dual front airbags, ABS with EBD and brake assist, ISOFIX, Front seat belts with pre-tensioners and force limiter and an engine immobilizer as standard fitments. The top-spec trim gets a variety of features. On the exteriors, it gets LED DRLs with LED projector headlamps, Electric ORVMs with turn indicators and alloy wheels. Inside the cabin, it receives adjustable front seat headrests, height adjustable driver seat, engine push start-stop button, Auto climate control, and Auto Headlamps. Also, it gets the SmartPlay infotainment system, steering mounted audio controls, Android Auto, Apple CarPlay and more. 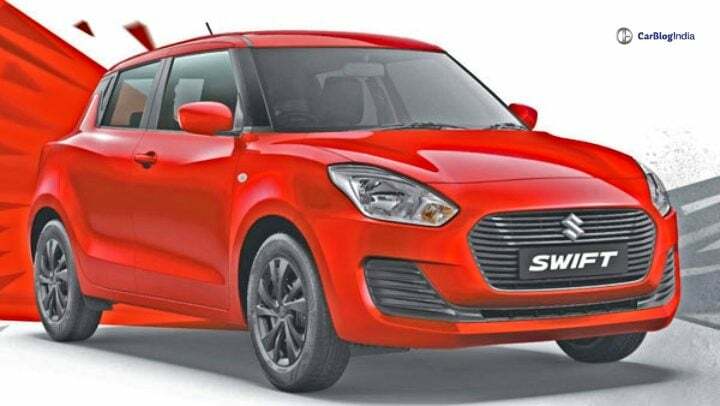 Safety features on the top-spec trim of Swift include the standard fitments with day and night IRVM, Reverse parking sensors with a camera, Front fog lamps, dual front airbags, ABS with EBD and brake assist and Speed-sensitive automatic door lock. The Maruti Suzuki Swift petrol variant starts from Rs 4.99 lakhs and goes up to Rs 7.76 Lakhs. The diesel variant starts at Rs 5.99 lakhs and goes up to Rs 8.76 Lakhs (all prices ex-showroom New Delhi). The Swift takes on the likes of Tata Tiago, Hyundai Grand i10, Ford Figo and Honda Brio.